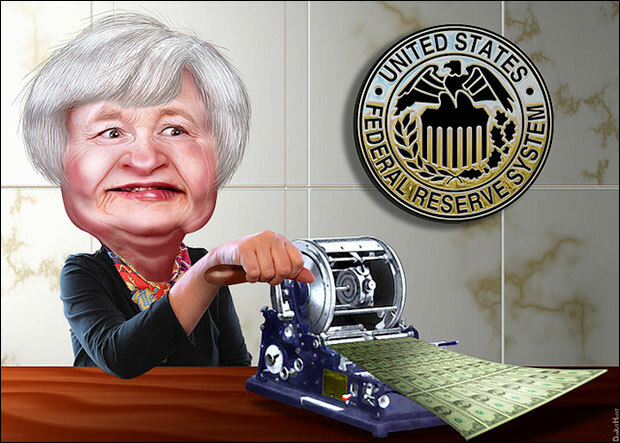 …It shows the scapegoat, Janet Yellen, along with two articles. The first article talks about the markets booming because she kept interest rates low, and the second offers a warning from the “wise” IMF that excessive risk-taking is happening because of the low interest rates. It is no coincidence that the IMF story hit the media on the same day Yellen announced she would leave the interest rate outlook unchanged. >>> The five-year bull market in U.S. stocks got a new lease on life, as investors embrace the steady-as-she-goes message the Federal Reserve is delivering on the economy and interest rates. Wednesday’s action underscores the investor belief that the Fed will raise interest rates next year, while the European Central Bank and Bank of Japan will continue pushing rates down in a bid to spur struggling economies. Fed policy has been credited with fueling the five-year-long bull market in stocks…. …some Fed officials have stated publicly that the central bank should be ready to move rates up sooner and faster than financial markets expect given the spate of mostly good news on the U.S. economy. So the financial markets expect an interest rate increase next summer. If it comes earlier (such as in March) and/or it’s a larger increase than expected, it will spook the markets and trigger a crash. From a scan I did of financial articles, Yellen plans to raise the rate if the official unemployment figures are less that 6.5% and the official inflation rate is above 2%. Once those criteria are met and appear stable, she will do the deed. So if we see the inflation statistics showing an uptick for a few of months in a row, we could get the early rate hike. Should they pull the interest rate trigger this year or next and start the slow-motion train wreck, expect to also hear leaks emerging from the Fed audit that will likely commence next year. Worsening economic conditions and damning leaked information will provide quite a buildup to the Congress versus the Fed showdown in 2016. By the way, don’t cry for Janet Yellen. She knows the role she must play, and she agreed to it. You can be sure she has a golden parachute waiting on the other side of what’s coming. This entry was posted in Globalist Disinfo, NWO on September 18, 2014 by kenneth.